5 Top Epilator Tips - These tips REALLY work! Using an epilator is an excellent hair removal method that will pay for itself quickly. It offers a lot of advantages over shaving or waxing that make it worth a look. Today’s products are a far cry from the old spring types from the 1980s. They’re easier to use with more efficient mechanisms. Our list of epilator tips will help you prevent many of the side effects from using it improperly. The main complaints against using an epilator involve skin issues. You might not be able to avoid some of them, especially if you have sensitive skin. Many are signs of inflammation that may occur if you don’t use it correctly. Our epilator tips focus on the best practices both before and after you use the device. To keep a step ahead of any pain, consider taking a non-steroidal, anti-inflammatory drug like aspirin or ibuprofen before you begin. Don’t let this information steer you away from what is an effective way to deal with unwanted hair. It’s not messy or time-consuming like waxing. It’s easy to use without the risk of painful nicks like shaving. It’s also less expensive over time when you consider the cost of blades or disposables. Let’s review what you need to know to make the most of the epilator tips. It needn’t remain a drudgery especially when you consider how long it lasts and the time you’ll save. 1. Clean Your Skin First. It’s essential to wash the area you’ll epilate before you start. It will make the process a lot easier in two ways. First, it’ll remove dirt and oils that could affect the performance of your epilator. With clean skin, it can glide across the surface easier without a lot of effort. Second, it’ll get rid of bacteria that can cause inflammation and infections. Using an epilator isn’t invasive because it won’t affect the top layer of your skin. It works by pulling out the hairs by the roots in a swift movement, depending on the type. However, you’ll likely experience some irritation for the first few times you use it. That’s why it’s important to take steps to prevent infections, especially if your skin is broken. That will literally open up the door to further problems. More severe issues include skin conditions like folliculitis. Using an epilator instead of shaving can curb your risk. 2. Exfoliate Your Skin to Remove Dead Skin Cells. Your body constantly sheds dead skin cells. They’ll only live about two to three weeks. You probably notice it after you take a shower and towel off when you’re done. It’s essential to remove this buildup to keep your pores open and get rid of a potential source of bacteria. When you do it before epilating, it’ll help your hairs stand up and, thus, make it easier for the device to pull them out from the roots. It’ll make the job quicker and less painful too. Exfoliating has other benefits too. It’s an excellent way to prevent unsightly and sometimes irritating ingrown hairs. That brings up one disadvantage of using an epilator. Pulling hairs out in the opposite direction of growth increases your risk of them, making exfoliating an essential task. 3. Start Small for the Best Results. We have to talk about a little TMI here if you’re going to benefit from the best epilator tips. If you’ve been growing that winter coat for a long time, it’s important to get it under control first. You can shave the area first to make it more manageable for the epilator. Then, use it as your go-to hair removal method after the regrowth appears. If the hairs are too long, the epilator will yank them which can lead to bruises or sores. In the worst case scenarios, it can even cause scars or infections. The good news is that it gets easier after every time. The best way to get the most out of your epilator is to use it regularly. What you do after using an epilator is just as important as the prep you do before you start. The goals are to stem any irritation that may occur after you’re done. We won’t lie to you. It’s not going to be the most pleasant experience the first time. That’s why some people experience inflammation. It’s essential that you don’t push the epilator hard into your skin, but rather let it do its thing. You may see some symptoms that we mentioned earlier. However, you can prevent many of them with some simple steps. Patting cool water on your skin can relieve some of the symptoms of irritation. The redness and swelling are the effects of your immune system’s response. Their purpose is to increase blood flow and flood the site with white blood cells to fight off any pathogens or disease-causing organisms. The cool water tames these symptoms. Often, it follows a cascading effect. The increased blood flow warms the area which, in turn, causes itchiness. We won’t talk about what happens after that except to say don’t do it—ever. Scratching or rubbing will aggravate your symptoms and make you uncomfortable. Make sure to use a clean towel and rinse it often so that it stays cool. Pat it gently on the affected areas. Follow up with a dry one to get rid of any moisture. Then, you can proceed with your routine as usual. You should wear loose-fitting clothing over the areas where you’ve used your epilator. Remember that your skin’s sensitivity is in overdrive right now, making it one of the best epilator tips. Tight-fitting clothes will rub against it and increase the severity of your symptoms. It may also ramp up the itchiness along with your temptation to scratch it. If you can’t handle the itch, try using an anti-itch cream or a product like calamine lotion for temporary relief. You might even consider taking an antihistamine too. Your skin will heal quickly after epilating along with the accompanying inflammation. You may find that this precaution is only necessary for the first several hours after you’re done. Bonus Tip: Go Light and Easy. You may find it soothing to use a light body lotion on the area after you’re done. Look for a product with ingredients such as aloe vera to calm any signs of irritation. Avoid heavier creams that can trap bacteria and increase your risk of infection, especially if your skin is damp. Let it dry completely before applying for the best results. 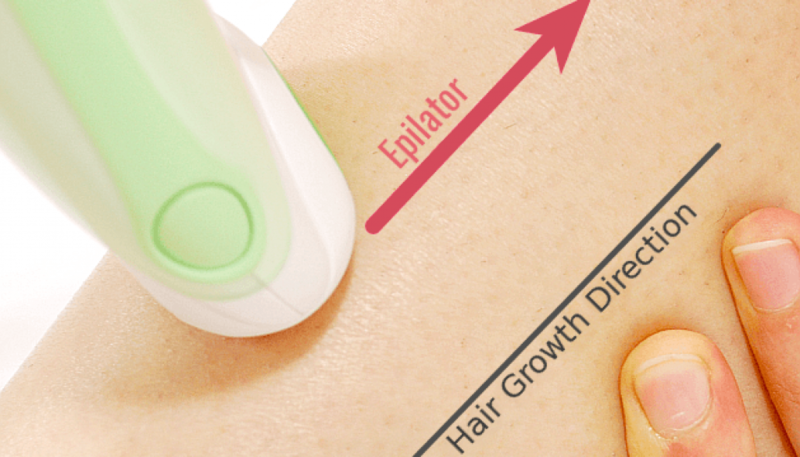 The most effective epilator tips aren’t fancy or rocket science. They’re just plain common sense when it comes to avoiding and preventing irritation. And many are some of the same things you’ll do no matter what method you use. We classify them as best practices. Just remember to take care of your skin before and after hair removal. It’s an excellent way to enjoy the benefits of using an epilator without any of the hassles.